Two Scotches in, with seats on the floor of Oklahoma City’s Chesapeake Energy Arena, Harold Hamm is feeling good. And why not? His hometown Thunder is spending the evening whupping the Philadelphia 76ers. Earlier Hamm announced big bonuses for Continental Resources employees, courtesy of record oil production. And a judge’s ruling, revealed that morning, in Hamm’s divorce case suggested the energy tycoon would keep the Continental shares he already owned when he married soon-to-be-ex Sue Ann Hamm 26 years ago. With that chunk of stock, encompassing about $16 billion out of his $16.9 billion fortune, Hamm owns 70% of Continental. As every wildcatter knows, such is life in the oil patch when you’re on a hot streak. And Hamm’s on perhaps the most epic one in domestic energy history, perhaps save for John D. Rockefeller’s. No one, aside from kings, dictators and post-Soviet kleptocrats, personally owns more black gold — Continental has proved reserves of 1 billion barrels, mostly locked underneath North Dakota. Hamm took the company public in 2007 — and shares are up 600% since, as the revolution in horizontal drilling has given America a cheap energy booster shot, fueling factories, keeping a lid on gas prices and adding millions of jobs. And lest you think anyone with a lease and drilling rig can strike it rich in the middle of the country, crane your neck alongside 68-year-old Hamm’s. “Is he over there?” he asks, peering down the baseline of the basketball court. Yes, Aubrey McClendon, the former CEO of Chesapeake Energy and a part owner of the Thunder, sits in his usual seat. Paragon of virtue? Maybe, maybe not. But what’s clear is that Hamm made money the old-fashioned way: He stuck with what he knew — and innovated. McClendon bet $13 billion in borrowed money that he could buy millions of acres of trendy shale gas fields and flip them at top dollar, but he nearly bankrupted Chesapeake (and soon thereafter lost his job) when prices collapsed from the oversupply he helped create. In terms of building the company poised for America’s new energy era, Hamm has already won. Hamm plodded along with a buy-and-hold plan for less glamorous oil. Convinced that the newly combined recipe of horizontal drilling and hydraulic fracturing had the potential to unlock not just gas but also oil from deep source rock, Hamm instructed Continental to lease hundreds of thousands of acres while most of the rest of the industry just scratched their heads. Today North Dakota’s Bakken field produces nine times more oil than it did five years ago, and Continental is good for more than 10% of what comes out — some 100,000 barrels a day. Sure, there remain legitimate concerns about the environmental impact of fracking. But you wouldn’t want to see what the American economy would look like without it. Harold Hamm’s story is actually the story of postwar domestic energy. Hamm, in fact, was born just a few months after V-J Day, the 13th and last child of Okie sharecroppers who moved to the boom-and-bust oil town of Enid, a place where everyone had seemingly stepped out of the James Dean movie Giant. “The people there were different, charismatic, bigger than life,” remembers Hamm. He was especially inspired by, of all things, a local potter. At a school assembly, John Frank of Frankoma Pottery in nearby Sapulpa brought his wheel onstage. “He had this lump of clay that he was slapping like a baby,” says Hamm. “It was clear that he did well because that was his passion, his art, and the message was that all of us could do well if we followed our passion in life.” Given his upbringing, Hamm’s was oil. Those who don’t will whisper stories about how the “cantankerous” and “bare-knuckled” Hamm may have skimmed off a little bit of his customers’ oil when he was pumping water out of their holding tanks. By 1971 he was more interested in accessing oil directly from the ground, and he had cobbled together enough assets to borrow against and drill his first well. For the next 15 years he did well during the good times (the late 1970s and early 1980s) and struggled to hold on during the busts (the late 1980s). A string of 17 dry holes in a row almost bankrupted him. His big breakthrough came literally from the heavens. In the early 1990s, while scouring rural Oklahoma for overlooked oil, Hamm came across an ancient meteor crater, where the rock had been blasted into the sky and then settled back as a highly porous, permeable layer. Over millions of years this crater was buried 9,000 feet underground and became saturated with oil. The field gushed what Hamm figures was 17 million barrels of oil and gave him the financial security he needed to take the leap that has defined his career. Now flush, and steeped in how to draw oil from a stone, Hamm became transfixed by the potential in North Dakota. In the late 1980s oilmen there had begun experimenting with drilling horizontally to better intersect the thin layers of oil-bearing rock known as the Bakken shale. Hamm joined the party in 1995, drilling his first wells in the area. By then, however, interest was dying: New wells had proved uneconomical, flowing at an initial rate of only 150 barrels per day. Yet Hamm, as well as engineers from Houston-based EOG Resources, had a vision of what could be. Down in Texas, George Mitchell and his Mitchell Energy & Development had combined horizontal drilling with hydraulic fracturing to blast open impermeable (or “tight”) rock. This is the innovation that made all the difference. 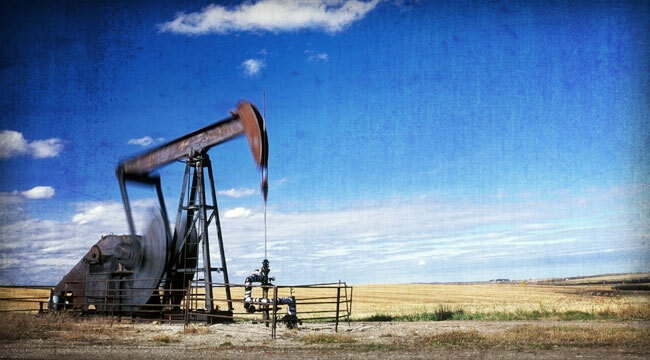 Today it’s common for a Bakken well to start flowing at 1,500 barrels per day. While other companies, including EOG and XTO Energy, also had the foresight, no other individuals would wind up making even a fraction of the fortune that Hamm would. True to his hardscrabble roots, even when tapping growth capital, he was loath to give up any equity at all in what he had come to name Continental Resources. He’d much rather borrow. There’s another reason he’s been able to keep so much equity and thus wind up with a disproportionately high individual stake in the fracking/horizontal drilling boom: spending habits that would be frugal in an accounting firm, much less the easy-come, easy-go wildcatting culture that McClendon personifies. Hamm’s favorite lunch spot is an Oklahoma City cafeteria called Sweets & Eats, where this billionaire finishes a meal of vegetable beef soup by crumbling up his corn bread into a styrofoam cup half-full of whole milk and eating it with a spoon (lunch for two: $18). Until 2012 Continental had remained based in Hamm’s hometown of Enid, and it’s only by walking back to his downtown Oklahoma City headquarters that the accretive benefits of his financial discipline become stark. For decades in Oklahoma the path to success was clear. Start an oil and gas company. Get big. Move to Dallas or Houston. That’s what happened to Phillips Petroleum, Conoco, Kerr-McGee, even Halliburton. But that’s changed. Devon Energy could have decamped in 2001 after it paid $3.5 billion to acquire Mitchell Energy. But not only did Devon decide to stay in Oklahoma City, it also recently completed its shiny 850-foot, $700 million tower, the tallest in the state. Then there’s Chesapeake, which under McClendon’s leadership built a stunning 120-acre campus. Both companies teamed up to help turn an ugly city drainage canal into a beautiful rowing venue, replete with high-tech boathouses for the U.S. Olympic team. “Suddenly Oklahoma City has emerged as a viable option for a growing public company,” says Mayor Mick Cornett. More acutely, Hamm points out his head count: 950 versus Devon’s 6,000 and Chesapeake’s 11,000. Yet Continental’s market capitalization, at $23 billion, is just a tad under Devon’s — and already well ahead of Chesapeake’s. In terms of building the company poised for America’s new energy era, Hamm has already won. The benefits derived from America’s $150 billion annual investment in horizontal drilling carry many, many zeroes. Domestic oil output has surged by 50% since 2010, creating more than 1 million jobs while slashing some 800 million barrels off of annual imports. Shale gas production has risen to more than 10 trillion cubic feet per year from nothing 15 years ago. Oil prices have stayed high, but U.S. consumption has been flat for five years, resulting in $100 billion a year in petrodollars that now stay in the U.S. instead of accruing to the likes of OPEC and Russia. Natural gas prices, meanwhile, have halved since 2008 to about $4.50 per thousand cubic feet. A Yale study figures the direct savings to America amounts to roughly $125 billion. Researchers at energy consultancy IHS say the oil and gas boom is contributing $300 billion a year, or more than 1.7% of GDP. Take that away and President Obama’s tepid recovery would look downright anemic. Which perhaps explains why Hamm, Mitt Romney’s energy advisor during the 2012 election, lashes out at anyone who wants to rein in the boom. He’s happy to provide black binders full of “research” on antifracking activists like Josh Fox, Bill McKibben and especially Tom Steyer, the San Francisco billionaire who founded Farallon Capital and has now pledged $100 million to back progressive politicians. If you assume a conservative average…the ultimate recovery from the Bakken could be 30 billion barrels. Listen to Harold Hamm and you leave convinced that America’s great shale energy boom is still in its infancy. There are enough natural gas reserves, he says, to allow America self-sufficiency for the next 200 years. 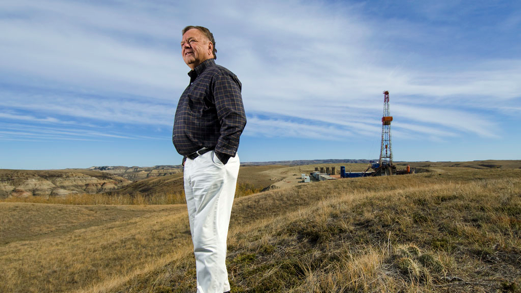 As for oil, he says North Dakota’s Bakken field alone will “absolutely” double output to 2 million barrels per day, a bullish prediction no other industry leader will touch. “He’s a little bit over the top,” says Mark Papa, the former CEO of EOG Resources, the number four operator in North Dakota. His forecast tops out at 1.3 million barrels. The nearest bull to Hamm, Wood Mackenzie analyst Jonathan Garrett, won’t go past 1.7 million by 2020. Hamm won’t be dissuaded. He says no other company has studied the geology as carefully as Continental. It knows where the oil is, he says, so it’s simply a challenge of figuring how much it can get out, as quickly as possible, at the lowest cost. The technology that may determine how long and strong the recovery can get is being tested on a 2-square-mile plot in the Bakken that Continental calls the Hawkinson unit. Here Continental is experimenting with a “full field” technique — densely packing wells so that each rig (Hamm has 20 in North Dakota) can do considerably more than the current average of 10 wells per year. On the Hawkinson unit it has already drilled 14 wells, out of a planned 32. The wells go down roughly 3 miles, then curve horizontally for another mile to intersect one of at least four layers of oil-filled dolomite rock sandwiched in between impermeable layers of shale. The drillers use explosives to pop small “perforations” in the sides of those horizontal pipes, then blast down millions of gallons of water mixed with sand to pulverize the rock and open up fractures, enabling the oil to escape. The trick is to position the “laterals” directly into the middle of those rock layers, but just far enough away from each other that the fractures don’t overlap. If this density works, there will ultimately be room for at least 100,000 total wells in the Bakken. (Fewer than 7,000 have been drilled so far.) The implication: If you assume a conservative average of just 300,000 total barrels per well, the ultimate recovery from the Bakken could be 30 billion barrels. The U.S. uses 7.5 billion barrels per year. “Suddenly, you see the enormity of what we’re talking about here,” says Hamm. The risk, of course, is that if these wells can’t churn out that kind of output, the math of oil extraction is unforgiving. Wells that come on line at 800 to 1,000 barrels per day would be lucky, after a year, to still be doing 400 barrels. “With such hyperbolic decline rates there’s no doubt you’re fighting the treadmill effect as you put more of these wells on line,” says Cameron Horwitz at U.S. Capital Advisors in Houston. But such headaches will prove ephemeral if Hamm wins his bet and delivers on his promise of unlimited oil and gas. Such results would surely make Hamm one of the 20 richest people in the world. And just as surely reshape America in the process. Ed. Note: Over the last two days, subscribers of the FREE Laissez Faire Today email edition have discovered two different ways of getting in on all the oil money being thrown around nowadays. You don’t need to be part of the 1%, and you don’t need political connections to start raking in cash. You just need to read the Laissez Faire Today email edition, so you won’t miss out an another opportunity in the future. Click here to sign up for FREE, right now. This article was also prominently featured at Laissez Faire Today. Less than 10%. I’m referring to the amount of oil or natural gas in the ground that a typical shale well recovers. That means that more than 90% of the hydrocarbons that are trapped in the rocks are left behind. Christopher Helman covers the energy industry and the tycoons who control it. He joined Forbes in 1999 and moved from New York to Houston in 2004. The subjects of his Forbes cover stories have included T. Boone Pickens, Harold Hamm, Aubrey McClendon, Michael Dell, Ross Perot, Exxon, Chevron, Saudi Aramco and more.